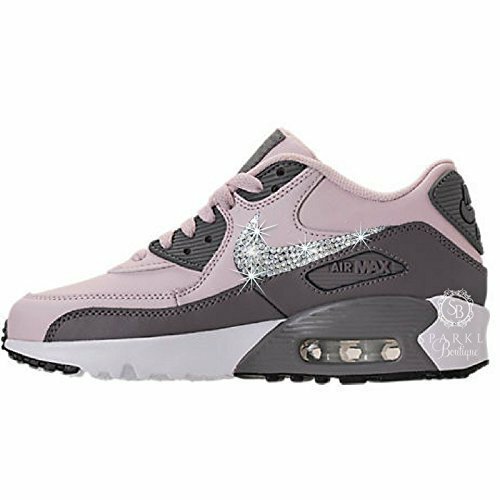 Nike Air Max 90 Casual Leather CUSTOM BLING shoes! ~ SWAROVSKI - 2088 XIRIUS ROSE CRYSTALS shine like diamonds! YOU will turn heads & get the attention YOU deserve wearing these CLASSY, UNIQUE & SPARKLY Nikes! Don't see the shoe you want? Message me for details on finding YOUR perfect style! Note* Shoes may sell out fast - In this case I will contact you ASAP to let you know. Industrial glue is used to make sure all crystals stay nicely in place. * Note - These will be ordered upon purchase from a authorized dealer ~ Please allow 7-15 days to ship out. These are a YOUTH Shoe - Simply choose what size you are in a women's size in the dropdown.